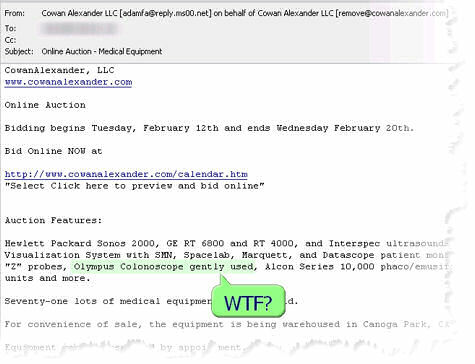 I must have registered for this auction house in the past, because every now and then I get emails from cowanalexander.com about an upcoming auction of business assets. You read that right. A “gently used” Olympus Colonscope. First, I hope that all colonscopes are used gently. Second, I don’t want to be at the ghetto gastroenterologist’s office that had to buy a used colonscope. They should definitely have to have a disclaimer somewhere about that. Here’s the full list of items for sale in this auction. There’s already a $50 bid for this like new item. Surely my nether regions deserve a more expensive camera than that! iphone camera – where’s the hype? I’m a bit behind on the iphone hype. After seeing a story on the yahoo.com frontpage today, I decided to re-check it out at apple.com. This video pretty much sold me. I can’t believe I spent 20 minutes watching a commercial. But the one thing that stood out the most was the fact that the Apple iphone camera features are not prominently featured on the site. It’s briefly mentioned in the video tour when they are talking about the photo gallery features, but they never show the iphone camera in action anywhere. There’s no specs (that I can find) on the camera feature and I can’t even tell if it has a video feature. They have more hype up their sleeves. At first I thought it was the former, but the more I think it about it, I’m guessing it’s the latter. I was pretty surprised to see a “youtube button” on the standard iphone menu interface. That says a lot about the importance of youtube today. YouTube has a button on the most popular gadget of 2007. It’s pretty clear that Apple and Google are pretty buddy buddy on this new toy. Google is the default search (yes, it can be changed), Google Maps is heavily featured (has its own button), Gmail is supported out of the box (along with Yahoo mail), and YouTube (owned by Google) is prominently featured. I’m thinking that the full coolosity behind the photo/video features of the iphone have yet to be revealed. Wireless 1 button youtube video uploads? Easy photo capture and wireless sending via Google’s HELLO instant messenger. HELLO is easily the most underrated app out there today. It is the best instant messenger for sending photos and just plain chat. If you haven’t used HELLO, go try it today. You can send a 5MB photo to your family or business partner in seconds. If the iPhone turns out to have those features, I’ll dump Verizon tomorrow and jump on the Apple bandwagon…early contract termination fees and all. I wonder how many subscribers Verizon will lose to this new tech meme? Due to some server issues, you may need to remove the webdiscuss newsgroup from your newsreader and then add it back again to see the current discussions and post in the newsgroup. I recently ran across this great flash tutorial showing effective ways of communicating with your clients via email. best articles on web design, ever. If you are thinking about designing your web website, have designed a website for yourself or others, or think you know everything, Web Design From Scratch is a great resource. It’s free speech here and it’s a free newsgroup. You are free to say what you want to say, and others are free to reply to you as they deem appropriate.